Livedrive is focused on revolutionizing the means of storage and accessing documents, photos, music album, video collection and other digital content. Livedrive has launched their service in December 2008, since then there was no looking back. It's become one of the leading cloud storage provider with more than 500,000 paying customers over the globe. 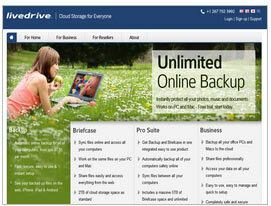 Livedrive offers hassle free unlimited storage at feasible rates. Livedrive works with a simplified vision; store your data on Livedrive instead on your system. It became the one of the most favorite online backup company in the US and Europe, winning prestigious awards like Web User Gold and Computer Active Best Online Backup Buy It. Andrew Micheal, one of the UK’s brilliant businessman who pioneered the web hosting industry in UK is backing Livedrive. Several renowned retailers; PC World, Dixons and Currys in UK while CompUSA and TigerDirect in USA are in a partnership with Livedrive. They provide unlimited backup for 5 systems with synchronization space of 5 TB just for $ 15 per month. It offers attractive packages to entrepreneurs, system integrators and web designers. Also, it allows you to sale online backup, cloud storage and remote access to your customers once you become a member of the Livedrive reseller program. Their dedicated support team ensures that you get things done as desired. Livedrive bring easy access through a web interface, which has a music player and photo viewer for thumbnail previews. It also allows to preview word file and PDF document. Live Drive Review, Cloud storage and unlimited online Cloud backup from Livedrive. Easily online backup, share and store documents online on Cloud.